The original Wind Waker for the Gamecube, released in 2003 was undoubtedly one of the finest games on the system and arguably one of the greatest games of the past twenty years. Its unrivalled sense of exploration, excellent combat and charming cartoon visuals have ensured that even a decade later, it’s a brilliant looking game that is still fun to play. How has Nintendo managed to improve this gem with their new HD update for the Wii U? For a start, it’s absolutely gorgeous. This remake isn’t merely the same graphics translated to HD, but a complete overhaul of new textures, character models and lighting. Sailing across the deep blue sea, as the sky blurs into the horizon and the sun sets, bathing your boat in a deep orange is a joy. The juxtaposition of the wide blue expanses of the open sea, and the dark, moody lighting of the many dungeons and caves scattered through the land constantly serves to keep things fresh and interesting. When you finally emerge victorious from a dank dungeon, the bright skies of the open world are a genuinely welcome reward. Occasionally, stepping into the glow of a torch can cast your cel shaded character into an ugly light, making them look almost clay like. It’s fairly off-putting, but for the most part, the updated lighting serves the varied locales and colourful characters well. Of course, a pretty looking game means nothing if it’s no fun to play. Thankfully, Wind Waker HD builds on everything that made the original so great and adds a selection of subtle tweaks and improvements. Playing with the gamepad is a revelation. As your inventory and maps are all ready for instant viewing on the touch screen controller, you never actually have to pause the game to stop the action. You can simply drag up the items you require on the gamepad while the action rages on, on your television. The gamepad also serves to make sailing less of a chore. One of the biggest complaints many people had with the original Wind Waker was the sailing. It was too slow, too laborious and you spent too much time doing it. No more do you have to pause to check where exactly you are, simply glance at the gamepad to reaffirm your location. No more do you have the spend so much time sailing, as a new item in the game reduces your sailing time by half and doesn’t require you stop to change the direction of the wind every few minutes. Nintendo also realises it’s just as important to leave what worked alone. The excellent combat, engaging story and massive open world all remain intact. Fighting enemies has never been more satisfying, as Link’s varied arsenal offers a variety of ways to dispatch a foe, ensuring combat never gets stagnant. The wide open sea offers more freedom than any other Zelda game. While many have complained that Wind Waker’s large world had nothing to it, I would point them in the direction of the various enemy watchtowers, pirate bases, giant sea monsters and dozens upon dozens of islands littered with secrets. Wind Waker’s fantastic sense of exploration is one of it’s stronger aspects, almost making up for the length and difficulty. And it’s in terms of length and difficulty that made up my mind when reviewing this game. Hero mode, available from the start, offers more of a challenge for this notoriously easy of Zeldas. However, once you get a certain number of hearts and bottles for fairies and potions, it becomes nearly indistinguishable from normal mode. Length has been the major sore point. 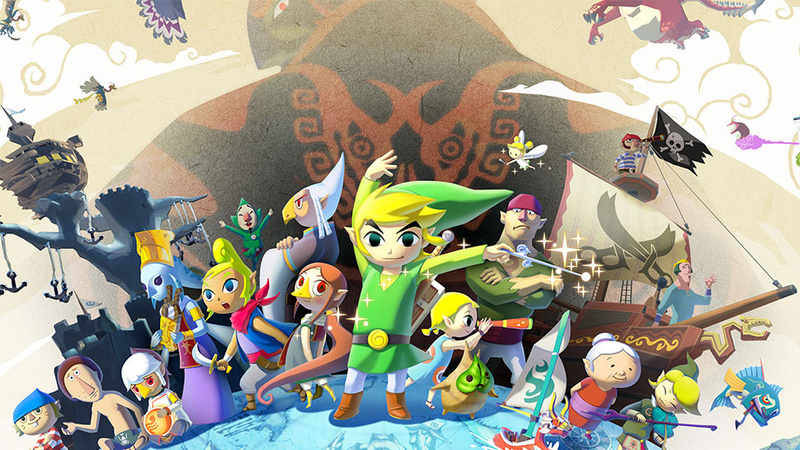 I was always annoyed with the length of Wind Waker, mostly because I love it so much and hate that it has to end. The game has been made even shorter with the streamlining of the Triforce fetch quest, a quest I personally enjoyed as it encouraged you to delve into the exploration and treasure hunting aspect of the game. While Nintendo may have missed a chance to include some much needed extra content, this is still the definite way to experience the most underrated of Zeldas.